Much more than a knack for snappy comebacks, wit is the quick, instinctive intelligence that allows us to think, say, or do the right thing at the right time in the right place. In this whimsical book, James Geary explores every facet of wittiness, from its role in innovation to why puns are the highest form of wit. Geary reasons that wit is both visual and verbal, physical and intellectual: there's the serendipitous wit of scientists, the crafty wit of inventors, the optical wit of artists, and the metaphysical wit of philosophers. 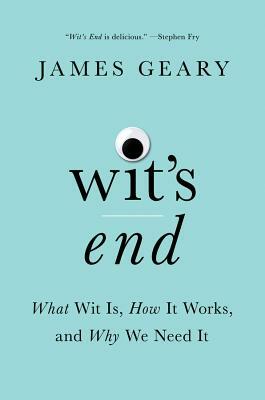 In Wit's End, Geary embraces wit in every form by adopting a different style for each chapter; he writes the section on verbal repartee as a dramatic dialogue, the neuroscience of wit as a scientific paper, the spirituality of wit as a sermon, and other chapters in jive, rap, and the heroic couplets of Alexander Pope. Wit's End agilely balances psychology, folktales, visual art, and literary history with lighthearted humor and acute insight, drawing upon traditions of wit from around the world. Entertaining, illuminating, and entirely unique, Wit's End demonstrates that wit and wisdom are really the same thing.